In the previous installments we reviewed the basic advantages of effective perioperative, multimodal pain control. Analgesics coupled with sedative/tranquilizers provide a more comfortable patient and staff experience, reduce induction and maintenance agent requirements, and generally improve patient morbidity and mortality. Multimodal techniques reduce the dose of each individual drug which, in turn, reduces the potential for adverse drug effects. Intervening before the pain system becomes sensitized is an absolute necessity when your goal is optimal patient benefit. In Part IV, we will continue our review of the various drug families, individual agents, and drug delivery methods that contribute to perioperative patient analgesic management. LOCAL ANESTHETICS including lidocaine, bupivacaine, and ropivacaine are inexpensive and versatile analgesic tools that may be incorporated into area infiltrations, regional blocks, and epidural injections. By reducing the pain response at the local level it is possible to significantly reduce the general anesthetic requirements of the patients likely improving their anesthetic stability as well as their overall postoperative comfort level. Lidocaine (and only lidocaine) can also be an effective analgesic when given as a constant rate IV infusion. Bupivacaine possesses significant potential for cardiotoxicity when given intravenously. Ropivacaine is less cardiotoxic but it too should not be administered intravenously. 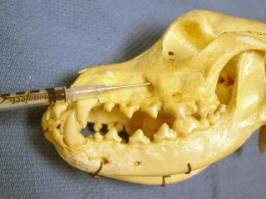 Local anesthetic agents are particularly attractive when performing oral surgery, amputations (nerve transections), thoracotomies (intercostals blocks and intrapleural infusions), orthopedic surgeries (joint infusions), declawing cats (ring blocks), and when neutering dogs and cats (intratesticular blocks). The fast acting, shorter duration agents (lidocaine) can be combined with the slower acting, longer duration agents (bupivacaine, ropivacaine) for best effect. Adding a small amount of opioid (0.075 mg/kg morphine or 0.003 mg/kg buprenorphine) to the local anesthetic mix may substantially extend the duration of analgesia obtained[i],[ii]. Epinephrine can also be added to the local anesthetic in hopes of improving its local retention and extending the duration of effect, but epinephrine should never be used to perform a ring block on distal extremities. Local anesthetics can be associated with significant adverse effects if they are not dosed and administered properly. Initially, overdoes are signaled by seizure activity in awake patients, but, even more seriously, cardiac depression and cardiovascular collapse can occur at high doses especially when given intravenously. It is generally felt that there is additive toxicity between the local anesthetics. Establishing a maximum dose, diluting as needed to provide adequate volume, and aspirating prior to injection should easily avoid adverse CNS and cardiac events. To avoid ischemic compromise, never use epinephrine containing local anesthetics when performing ring blocks on the extremities including the tail. Lidocaine, unlike bupivacaine and ropivacaine, has a very quick onset but its duration of effect is limited to 1 to 1 1/2 hours. Stock solution can produce an intense burning pain in conscious patients. Mixing 9 parts lidocaine with 1 part sodium bicarbonate can reduce this discomfort. Doses of lidocaine up to 5 mg/kg in dogs and up to 2.5 mg/kg in cats are considered safe for general infiltrative use. If larger volumes are required to cover a region, you may dilute the lidocaine with 1 to 3 equal parts of sterile water without losing reasonable effectiveness. Bupivacaine has a more delayed onset but a much longer duration compared to lidocaine. Initial sensory block may take 15 to 30 minutes for full effect. This delay is often overlooked by the surgeon and inadequate time allowed for anesthetic effect. By combining lidocaine with bupivacaine you can gain the best qualities of both products and avoid unnecessary procedural delays. Doses of bupivacaine up to 2.0 mg/kg in dogs and up to 1.5 mg/kg in cats are considered safe for general infiltrative use. When combining lidocaine with bupivacaine the easiest formula is to use 1 mg/kg of each drug. If larger volumes are needed simply dilute the agent(s) as described for lidocaine above. Ropivacaine is a newer amide class local anesthetic with a faster onset than bupivacaine and longer duration than lidocaine. It is less cardiotoxic than bupivacaine and may be somewhat more selective for sensory rather than motor nerves; a quality that is attractive when performing epidurals. Ropivacaine is more expensive than lidocaine and bupivacaine. Ropivacaine is dosed at up to 2.0 mg/kg in dogs and up to 1.5 mg/kg in cats. 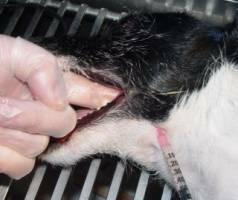 Declaw ring blocks are performed using a combination of lidocaine and bupivacaine or ropivacaine. Add 1 mg/kg of each into a syringe. 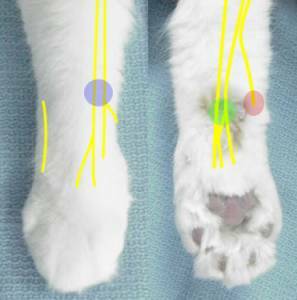 Add sterile water as needed to total 1 cc in cats up to 2.3 kilograms and 2 cc in cats over 2.3 kilograms, then divide into 6 equal amounts injecting, after aspirating, at the locations shown below. Make sure you do NOT use an epinephrine-containing agent in an extremity ring block or ischemia of the extremity will result. 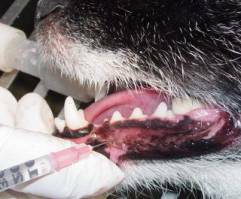 Dental nerve blocks are an important tool for managing anesthetic safety and patient comfort especially in aged pets less tolerant of higher general anesthetic levels. Add 1 mg/kg each of lidocaine and bupivacaine to a syringe adding sterile water as described above for larger volumes. Inject 0.2 to 1.0 cc per site proportional to patient size at the appropriate sites as shown below. 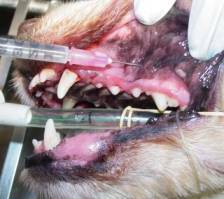 For a more caudal maxillary block place the needle further into the infraorbital canal, aspirate, then apply pressure with your finger over the infraorbital foramen while injecting the solution. Photos courtesy of Laura McLain Madsen, D.V.M. Intrapleural infusions can improve patient comfort significantly in the postoperative period. The initial dose should include up to 1.5 mg/kg lidocaine and up to 1.5 mg/kg bupivacaine, keeping in mind total patient dose of all overlapping local anesthetics. When infusing through a chest tube follow the local anesthetic with 2 to 5 ml saline to flush the tube. This infusion can be repeated every 3 to 6 hours typically using bupivacaine or ropivacaine alone for repeat dosing. 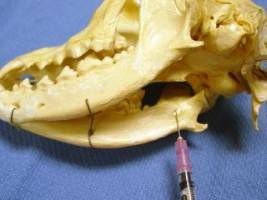 Intra-articular injections are very useful when performing joint surgery, especially cranial cruciate related procedures. Lidocaine is well suited to administration prior to the arthrotomy. Depending on patient size, 1 to 6 ml may be placed inside the joint after careful aseptic prep. Epinephrine containing lidocaine solutions can be used preop to reduce intraoperative hemorrhage. After joint closure, 1 to 6 ml of bupivacaine or ropivacaine may be placed inside the joint to provide sustained postsurgical relief. As previously outlined, adding 0.003 mg/kg buprenorphine or 0.075 mg/kg morphine to the local anesthetic will likely extend the total analgesic duration of the intra-articular block. Intratesticular injections of local anesthetics provide a major intraoperative patient benefit. With an IT block in place you avoid the sudden patient arousal not uncommonly seen when clamping the spermatic cord as well as providing significant isoflurane/sevoflurane MAC reduction predictably improving patient cardiovascular and respiratory dynamics. IT blocks are quickly and easily administered after patient clip and rough prep. Combining 1 mg/kg of lidocaine with 1 mg/kg of bupivacaine or ropivacaine and add 0.003 mg/kg buprenorphine or 0.075 mg/kg morphine for the best patient benefit. Use a 25g 5/8” needle for most cats and a 22g 1 to 1 ½” needle for dogs and large cats. Place the needle through the testicle starting from the caudal pole aiming for the spermatic cord. It is OK, even desirable, for the needle to exit the testicle proximally as it is the spermatic cord that will receive the direct clamp stimulation. ASPIRATE BEFORE INJECTING. Inject, expecting firm backpressure, while withdrawing the needle. Expect to use about 1/3 to 1/2 of the drug volume per testicle leaving the organ firmly turgid. Repeat for other testicle. The left over drug can/should be used to place a dermal incisional block. The total time for this procedure should be 1 to 2 minutes. Drugs costs: 3 kg cat = $0.04; 55 kg dog = $0.65. Videos of this procedure can be found at: http://www.vasg.org/intratesticular_blocks.htm. ANTICONVULSANTS - calcium channel blockers originally developed as anticonvulsants have been shown to be effective pain management tools with low side-effect profiles. In the mid-1990s gabapentin was found be an effective agent for the management of chronic neuropathic pain[iii],[iv]. More recently, studies in human patients have shown that preoperative oral gabapentin can significantly reduce postoperative pain while reducing a patient’s opioid requirement[v],[vi]. Pregabalin is a newer calcium channel blocker that holds promise for the future but lacks inadequate support to warrant inclusion in this review. Oral gabapentin dosed at 10 mg/kg 1 to 4 hours before surgery is an attractive preoperative pain management tool for dogs and cats. The patient benefit equals that of NSAIDs without the intraoperative blood pressure concerns of the NSAIDs. Postoperative gabapentin has been shown to be as effective as NSAIDs for human “spay” patients making it a good selection for our patients intolerant of NSAIDs. Better yet, when our patients are NSAID tolerant, we dispense 72 hours of gabapentin combined with an NSAID. In human studies, patient groups given both drugs (versus either drug alone) were the only group that reported 100% satisfaction with their postoperative pain control. This short term gabapentin use also translated into superior long term pain control (1 month postoperative)[vii],[viii] ,[ix] ,[x] ,[xi],[xii]. As a cautionary note: to the author's kwnowledge, all liquid forms of gabapentin contains xylitol making it unsuitable for canine use. CONSTANT RATE INFUSIONS have become a frequently utilized analgesic delivery method. Delivering drugs via this route allows for a more consistent drug delivery that avoids the peaks and valleys associated with intermittent administration. CRIs also allow for much greater control of the medication’s effects both positive and negative. Drugs commonly delivered through CRIs include morphine, hydromorphone, fentanyl, ketamine, midazolam, lidocaine, and medetomidine. The opioids provide titratable analgesia that benefits the patient at the peripheral and central levels. Nausea, clinically relevant bradycardia and respiratory depression are not expected at normal analgesic dose rates. Ketamine enhances analgesia via two different mechanism; NMDA antagonism reducing central sensitization as well as a direct analgesia via the D2 dopamine receptors. Midazolam provides sedation and relaxation as well as a MAC sparing effect that can be of major benefit for patients experiencing isoflurane or sevoflurane induced hypotenion. Lidocaine is capable of enhancing analgesia while providing an anti-inflammatory, reperfusion, and GI motility benefits. Medetomidine is attractive as an anxiolytic as well as a tool for enhanced patient analgesia in healthy patients. CRIs can be delivered through the IV fluid bag route or directly through a syringe pump. The IV fluid bag route is attractive because it allows for precise delivery rates using equipment already available at most practices. The simplest method involves a single fluid bag providing both the drug delivery as well as the patient’s fluid needs. The downside to this method is the inability to adjust the fluid rate without changing the drug delivery rate. To maximize the flexibility of this method you generally need to pick a midrange dose rate so that adjustments in patient fluid need don’t take you outside of the preferred drug dose rates. You can expand your flexibility by running two separate fluid lines through two different IV fluid pumps. In the two-pump model, the CRI drugs would be delivered at a very low rate (ex. 1 ml/kg/hr) while the patient’s additional fluid needs are separately managed through the second line. This allows for total flexibility of drug and fluid delivery but requires two pumps and double IV access. While the calculations of the various CRI delivery options may seem daunting, this headache has been eliminated by easy to use calculators directly available online at www.vasg.org/resources_and_support_material.htm. This calculator allows you to vary the IV fluid bag size, fluid delivery rate, and drug dose rates to satisfy any conceivable combination. Although the author does not recommend using gravity administration for analgesic CRIs this is an option that may be considered. The more current VASG calculators allow for the determination of gravity delivered drip rates. Working through a buretrol, you maximize control over drug delivery while also setting a limit to the maximum amount of drug delivered. Syringe pumps are the most ideal way to deliver CRI drugs. Programmable syringe pumps like the Medfusion 2001 and 2010i may be found on the secondary market for $500.00 to $1,000.00. The Razel Scientific Company makes very solid volume delivery based syringe pumps that cost $100.00 to $200.00 used and $550.00 to $800.00 new (http://www.razelscientific.com). When starting to explore CRI use, running a single agent ketamine CRI at 0.6 mg/kg/hr dose rate is a good start point. This should enhance the preanesthetic opioid analgesia without having too dramatic an effect on the overall patient appearance or inhalant agent needs. After the staff has developed an initial comfort zone with ketamine only CRIs consider adding lidocaine and morphine at the lower end of their dose rate range. Gradually work up to midrange combinations of the three drugs as the staff’s comfort zone expands, allowing the staff to see how the inhalant needs of the average patient decline as the CRI drug effects increase. The final step involves upper dose rate deliveries for the more painful procedure expecting significant reductions in the patient’s inhalant requirements. Loading doses, which may well be included in the preanesthetic and induction medications, should precede CRIs. Loading doses are needed prior to the initiation of the CRI in order to achieve initial therapeutic blood levels. Otherwise, it would take 3 to 5 half-lives of each drug to reach steady state drug levels. CRIs are inexpensive tools. An 8 hour mid-dose rate morphine/lidocaine/ketamine CRI for a 20 kg patient costs the practice less than $1.50 (drug costs). As with any drug use, the suitability of a given drug infusion should be based on a sound understanding of that drug’s use in a patient of that given health status. It is beyond the scope of this review to discuss detailed drug suitability issues. * Any mu agonist opioid provides an adequate opioid loading dose. **Telazol (tiletamine) provides an adequate ketamine CRI loading dose. ***The author suggests the lower loading dose for cat use and suggests that feline lidocaine CRIs be limited to 2 hours at upper dose rates, 9 hours at lower dose rates. ****Diazepam would also provide an adequate loading dose when initiating a midazolam CRI. TRANSDERMAL DRUG DELIVERY has become an attractive delivery method for some of our analgesic drugs. Transcutaneous patch delivery is available for fentanyl, lidocaine, and buprenorphine. We may be tempted to think of these as fire-and-forget analgesics. “Place a patch and you’re all set” may seem alluring but it is a flawed strategy. Like all analgesic methods, nothing works perfectly for all patients. A patch may allow for continuous drug delivery over an extended period but there is tremendous variability in the drug delivery through this route. A patch is best used as a component in a more balanced strategy including additional drug classes. The fentanyl patch has been around for quite some time. The branded Duragesic® patch has recently been joined by generic patch options. Fentanyl patches can help provide patient pain relief but they have limitations. Absorption studies have shown that a significant percent of our patients fail to reach or sustain therapeutic fentanyl blood levels[xiii]. Influences on drug variability include patient hypothermia and hyperthermia, which can decrease or increase drug absorption respectively. In dogs, the fentanyl patch may take 24 hours to reach full effect; in the cat about 8 hours[xiv]. Ideally, the fentanyl patch should be supported by NSAID, tramadol (dogs), transmucosal buprenorphine (cats), amantadine, or gabapentin use. The lidocaine (Lidoderm®) patch has been in use in veterinary medicine for many years. It is most effective when applied adjacent to incisions or over injured areas providing a local, not systemic, effect. Unlike the fentanyl patch, the lidocaine transdermal patch can be cut to any shape. It can provide relief for 12 or more hours. Ingestion of a lidocaine patch could cause serious lidocaine toxicity. Whenever a lidocaine patch is used it must be securely protected by appropriate bandaging and Elizabethan collar use. Transdermal buprenorphine use is not currently well supported. The human transdermal patch has not yet shown a therapeutic benefit in animal trials. There are anecdotal reports of practitioners having buprenorphine compounded in a PLO gel base for transdermal delivery. These practitioners express positive opinions supporting this route but there is, as yet, no research supporting this application. EPIDURAL INJECTIONS provide a concentrated drug effect at the spinal cord level while, generally, minimizing systemic drug effects. Opioids, alpha-2 agonists, local anesthetics, midazolam, and ketamine have all been shown to benefit the patient when administered epidurally. Lipophilic drugs have a more rapid onset but they are more rapidly absorbed shortening their epidural effect while exerting more systemic effects. Hydrophilic drugs have a slower onset and longer duration with less systemic effect. Preservative free products are preferred for epidural use but they are less readily available and more expensive. Amongst the more common preservatives, methylparaben is considered the least likely to cause adverse effects. The use of products preserved with formaldehyde (which is the case with the common US morphine preps) is not recommended. Opiods and local anesthetics are the most commonly used epidural drugs. Morphine and hydromorphone are the least lipohilic mu agonists providing the longest duration of effect. Buprenorphine has also been shown to be an effective analgesic when administered epidurally[xv],[xvi]. Fentanyl is not recommended; epidural administration is indistinguishable from IV administration. Lidocaine, bupivacaine, and ropivocaine are the most common epidurally placed local anesthetics. Lidocaine predictably provides the most rapid block of the shortest duration. Bupivacaine and ropivacaine provide longer lasting blocks but they do have a longer time of onset for full block effect. Remember spinal cord ends at L5-6 to L6-7 in dogs and L7-S1 in cats. Place patient in sternal recumbancy with rear legs pulled forward or in lateral recumbancy for certain fracture cases and when that is your personal preference. Clip and prep area as you would for any surgery. Use sterile gloves. If a drape is not used, the prepped area must be larger. Draw up sterile saline in a “test” syringe (assistant handles fluid bag). The test fluid volume should be different, smaller volume than the medication syringe to prevent confusion. Leave an air bubble in syringe to help in judging proper placement at injection. Draw up the medication(s) aseptically in a second syringe (assistant handles vials). If using glass ampoules, a sterile filter straw should be used to remove glass particle contaminants. Make sure volume in the medication syringe is clearly more than the test syringe to avoid confusion. Leave an air bubble in the medication syringe to help in judging proper placement at injection. Some prefer to use different size syringes to decrease likelihood of switching the syringes in error. Some prefer to use same size syringes to provide the exact same feel as the test syringe. Palpate the wings of the right and left ileum. The dorsal spinous process of L7 should be even with an imaginary line drawn across the dorsal iliac wings but can be just cranial or caudal to this line. The needle should be introduced just caudal to L7. Place the needle through the skin first, then place saline in hub for “hanging drop” technique. Needle should encounter three fascial layers with the ligamentum flavum being the final and most distinct pop. The saline in the needle hub should be pulled into the needle when the epidural space is entered. If the drop does not move but the feel suggests proper placement, proceed to test injection. Perform test injection with saline syringe. Aspirate before injecting. If blood is present withdraw needle, replace with new needle, reassess landmarks, and begin again. If spinal fluid is present proceed with injection but reduce the epidural medications volume by 50%. Inject small amount of saline. The bubble in syringe should not compress during injection. There should be no significant resistance to the injection. Connect medication syringe. Reaspirate before injecting medications. There should be no resistance to the injection. Withdraw needle. Expect a 30 to 60 minute delay between epidural injection and full epidural effect. Bupivacaine and ropivacaine provide up to 6 hours of regional anesthesia and analgesia. Morphine, hydromorphone, and buprenorphine provide up to 18 hours of regional analgesia. POSTOP "TO GO HOME" MEDICATION OPTIONS include a very broad range of choices. As with perioperative analgesia, multimodal outpatient strategies offer superior patient benefit while minimizing the likelihood of adverse events. Oral (per os) choices include tramadol, amantadine, NSAIDs, and gabapentin. TRAMADOL is a dual mode analgesic. It is metabolized into 2 isomers each with different analgesic benefit; one providing a mu agonist effect while the other provides a monoamine reuptake inhibition analgesic effect. Tramadol is available in relatively inexpensive 50 mg tablets. Tramadol is dosed at 1 to 5 mg/kg PO BID to QID. It is a bitter medication making it less well suited to cat use unless the cat can be pilled with the tramadol placed in a gelatin capsule. Tramadol is compatible with most other analgesic medications but should be used cautiously, if at all, for patients on SSRIs, TCAs, and MAOIs. Amantadine provides on ongoing NMDA antagonism that helps reduce the central sensitization process. It is available in 100 mg capsules and a 10 mg/ml liquid. Dosing ranges from 3 to 5 mg/kg PO SID. As amantadine is primarily excreted unchanged through the kidneys, its dose should be reduced for patients in renal failure. Although unlikely, signs of intolerance or excess dosing include general agitation and diarrhea. As with tramadol, amantadine’s bitter taste often limits its use in cats. While NSAIDs are usually well tolerated drugs as a class, they are not without potential for GI upset as well as liver and renal concerns. Healthy patients usually tolerate 5 to 7 days of an NSAID without adverse effects. NSAID can be coordinated with tramadol, amantadine, and gabapentin if needed for more complex pain. Remember that patients may respond and tolerate certain NSAIDs better than others. Only trial and error can predict the best choice for a given patient. Postoperative NSAID use in cats has limited options. There are no oral NSAIDs currently approved in the US for the cat. That being said, many veterinarians have been using the meloxicam liquid for long term use in cats. After an initial dose of 0.1 mg/kg PO for 3 to 5 days, the dose is reduced to 0.1 mg total dose PO SID every 24 to 72 hours if long term use is required. For accurate dosing it is recommended that a Tb syringe be used to draw up the exact drug volume. The injectable Metacam® product is currently labeled for a one time dose of 0.3 mg/kg (0.14 mg/lb) SC. Oral dosing following this injectable dose is not recommended. Gabapentin has a broad dose range; 1 to 10 mg/kg PO BID to TID. The least expensive options include the generic 100 mg, 300 mg, 600 mg, and 800 mg tablets. It is also available in a 50 mg/ml liquid. Cats are generally reasonably accepting of gabapentin compounded in a cat friendly flavored base. Gabapentin can be used for 3 to 5 days after less painful procedures, longer term especially for major procedures like amputations. Gabapentin is a very useful post-declaw medication for cats preferably teamed with buprenorphine TM and meloxicam PO. Butorphanol and buprenorphine are not logical oral (per os) analgesics. Mixing either of these drugs with an antibiotic or flavored liquid is not recommended. The enterohepatic first-pass effect renders 80% to 90% of these opioids ineffective. As noted earlier, even when properly dosed, butorphanol provides only mild analgesia of short duration. For example - a 20 kilogram dog would require 20 mg of butorphanol every hour to sustain a mild but very costly analgesic effect. Buprenorphine could theoretically provide effective analgesia via the oral route. However, the 80 to 90% loss via the first-pass effect means that it would need to be dosed at such a high oral dose it would make oral buprenorphine unaffordable. There are much, much better choices outlined above. Transmucosal (TM) drug delivery is a very attractive route as it bypasses the enterohepatic first-pass effect and it often easier to administer a small volume of liquid inside the cheekpouch of a cat compared to pilling a cat multiple times a day. Buprenorphine has been shown to be absorbed efficiently through the oral mucosa of the cat. Bioavailability is the same TM as IV in the cat. The pH of the dog’s oral cavity reduces the bioavailability of TM buprenorphine in that species. Until studies are performed TM buprenorphine use in the dog is not recommended. Transdermal choices include fentanyl and lidocaine patches as outlined above. These tools are quite attractive when managing a patient poorly tolerant or very resistant to oral medications. These patches can be used in combination with the above oral medications including tramadol. In general, it is unwise to depend on patch-based analgesia as the only patient analgesic tool. PATIENT SUPPORT plays a significant role in the overall tolerance of many of our perioperative pain medications and strategies. Effective body temperature support increases drug metabolism improving the patient’s rate of recovery and drug tolerance. Circulating warm water blankets with warm air warming systems (Bair Hugger®, Warmtouch®) maximize body temperature support. Electric heating pads and microwaved rice or oat bags continue to be the source of many very severe patient burns and are not recommended. Circulating ice water chiller systems like the Cryo/cuff® are excellent postoperative tools for minimizing joint swelling and discomfort. Rehabilitation/physiotherapy incorporated into the immediate postoperative period can help maximize the rate and quality of the patient’s recovery. LAST BUT NOT LEAST, surgical technique goes a long way towards influencing postoperative pain, particularly chronic pain which is most commonly neuropathic in nature. Minimize unnecessary nerve trauma through optimal anatomic knowledge and surgical technique. In a recent human postsurgical review of persistent pain following groin hernia repair, breast and thoracic surgery, leg amputation, and coronary artery bypass surgery up to 50% of the patients experienced pain lasting greater than 3 to 6 months after surgery[xvii]. Up to 10% of these patients experience severe persistent postsurgical pain. The intensity of the acute postoperative pain correlates with the risk of chronic postop pain. Because of the neuroanatomic and neurophysiologic similarities between animal and human patients there is every reason to assume that veterinary patients have similar chronic pain tendencies. Clearly, early aggressive pain management is in the best interests of the patient reducing both the acute postoperative pain and the risk of chronic postoperative pain. [i] Bazin JE, Massoni C, Bruelle P, Fenies V, Groslier D, Schoeffler P. The addition of opioids to local anaesthetics in brachial plexus block: the comparative effects of morphine, buprenorphine and sufentanil. Anaesthesia. 1997 Sep;52(9):858-62. [ii] Candido KD, Winnie AP, Ghaleb AH, Fattouh MW, Franco CD. Buprenorphine added to the local anesthetic for axillary brachial plexus block prolongs postoperative analgesia. Reg Anesth Pain Med. 2002 Mar-Apr;27(2):162-7. [iv] Gilron I, Watson CP, Cahill CM, Moulin DE. Neuropathic pain: a practical guide for the clinician. CMAJ. 2006 Aug 1;175(3):265-75. Review. [v] Hurley RW, Cohen SP, Williams KA, Rowlingson AJ, Wu CL. The analgesic effects of perioperative gabapentin on postoperative pain: a meta-analysis. Reg Anesth Pain Med. 2006 May-Jun;31(3):237-47. [vii] Rorarius MG, Mennander S, Suominen P, Rintala S, Puura A, Pirhonen R, Salmelin R, Haanpaa M, Kujansuu E, Yli-Hankala A. Gabapentin for the prevention of postoperative pain after vaginal hysterectomy. Pain. 2004 Jul;110(1-2):175-81. [viii] Dierking G, Duedahl TH, Rasmussen ML, Fomsgaard JS, Moiniche S, Romsing J, Dahl JB. Effects of gabapentin on postoperative morphine consumption and pain after abdominal hysterectomy: a randomized, double-blind trial. Acta Anaesthesiol Scand. 2004 Mar;48(3):322-7. [ix] Turan A, Karamanlioglu B, Memis D, Usar P, Pamukcu Z, Ture M. The analgesic effects of gabapentin after total abdominal hysterectomy. Anesth Analg. 2004 May;98(5):1370-3, table of contents. [x] Gilron I, Orr E, Tu D, O'Neill JP, Zamora JE, Bell AC. A placebo-controlled randomized clinical trial of perioperative administration of gabapentin, rofecoxib and their combination for spontaneous and movement-evoked pain after abdominal hysterectomy. Pain. 2005 Jan;113(1-2):191-200. [xi] Turan A, White PF, Karamanlioglu B, Memis D, Tasdogan M, Pamukcu Z, Yavuz E. Gabapentin: an alternative to the cyclooxygenase-2 inhibitors for perioperative pain management. Anesth Analg. 2006 Jan;102(1):175-81. [xii] Fassoulaki A, Stamatakis E, Petropoulos G, Siafaka I, Hassiakos D, Sarantopoulos C. Gabapentin attenuates late but not acute pain after abdominal hysterectomy. Eur J Anaesthesiol. 2006 Feb;23(2):136-41. [xiii] Lee DD, Papich MG, Hardie EM. Comparison of pharmacokinetics of fentanyl after intravenous and transdermal administration in cats. Am J Vet Res. 2000 Jun;61(6):672-7. [xiv] Hofmeister EH, Egger CM. 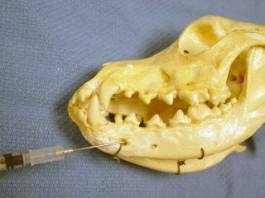 Transdermal fentanyl patches in small animals. J Am Anim Hosp Assoc. 2004 Nov-Dec;40(6):468-78. [xvi] Miwa Y, Yonemura E, Fukushima K. Epidural administered buprenorphine in the perioperative period. Can J Anaesth. 1996 Sep;43(9):907-13. [xvii] Kehlet H, Jensen TS, Woolf CJ. Persistent postsurgical pain: risk factors and prevention. Lancet. 2006 May 13;367(9522):1618-25. Last modified: November 8, 2011 .